Fish fossils at the Denver Museum of Nature and Science. Throughout the Experiencing Life series, we will be exploring various fossil sites. Because geography and geologic time do not match up in any certain pattern, it would be impractical to visit fossil sites from oldest to newest. But this page will put things into the context of doing just that. The graphic below shows a representation of geologic time, to scale, since the earth was formed. Starting on the left, the earth formed at the bottom of the Hadean Eon, 4,600 million years ago (or 4.6 billion years ago). As time moved upwards through the Archaeon and Proterozoic Eons, the microbes and whatever other organisms existed during this 4 billion year period did not leave much in the way of fossils. About 543 million years ago (mya), the "Cambrian Explosion" happened and we start seeing many more fossils. In the grand scheme of things, multicellular life, as we know it, has only been around for 11.8% of the time of Earth's existence! In the second column, an expanded timeline of the Phanerozoic Eon, the periods that make up the Paleozoic, Mesozoic and Cenozoic Eras can be seen more clearly. The Paleozoic Era represents multicellular organisms before the dinosaurs, the Mesozoic Era represents the time of the dinosaurs, and the Cenozoic Era represents the time since the dinosaurs went extinct. The time since the dinosaurs went extinct, 66.4 million years ago, at the beginning of the Cenozoic Era, is only about 1.4% of the time since the Earth was formed. In the third column, an expanded timeline of the Cenozoic Era, the epochs that make up this time period can be seen more clearly. The Tertiary Period and its Epochs make up the bulk of this Era. The Quaternary Period is the most recent period and represents only 0.04% of Earth's history. The fourth column expands the Quarternary Period, so the epoch in which we currently find ourselves can be seen at all. In the scale of time since the earth has existed, this 10,000 year span of time since the last ice age, named the Holocene Epoch, is shown as the small line at the top of the fourth column after expanding the timeline three times. The Holocene Epoch represents just 0.0002% of Earth's history. Even this amount of time (10,000 years) is beyond our comprehension. If we have grandparents who are 100 years old, that is 1% of the time since the last ice age. And that is about as much as we can relate to. The age of 100 of our very old grandparents has passed since the last ice age. In relation to the age of the Earth, our 100-year-old grandparents have lived just 0.000002% of the time! The earliest evidence of Egyptian civilizations comes from about half of the time since the last ice age, which means recorded history only makes up about 0.0001% of Earth's history. For all of these examples, that's just too many zeros after the decimal point for most of us to relate to. But here's the graphical representation anyway. At the very least, it will give you something to refer to when discussing geologic time periods. Geologic timeline, to scale. The numbers within the lines stand for millions of years ago. 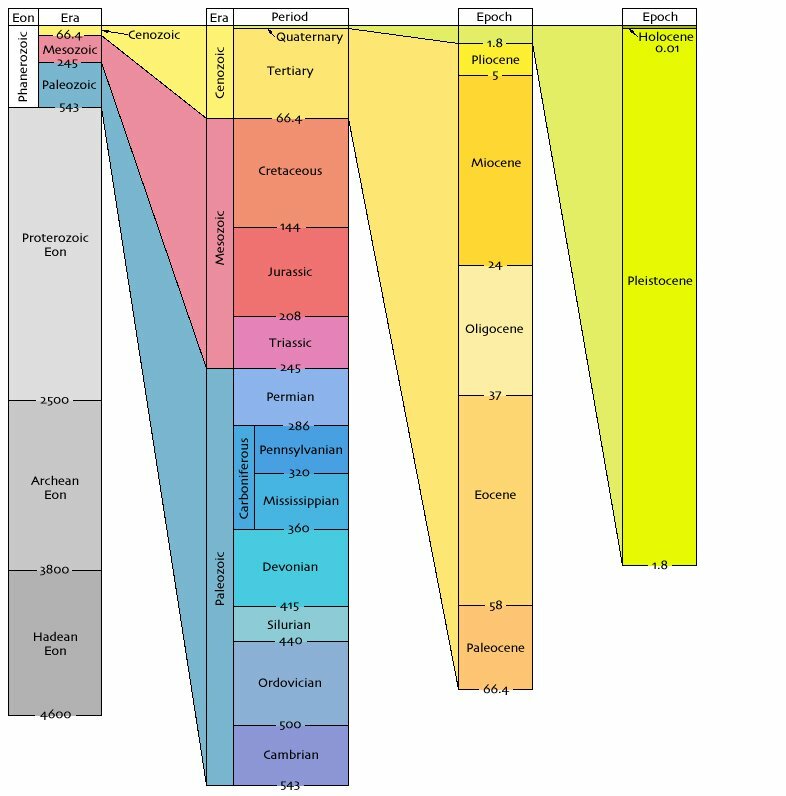 Below is a chart using the same colors as those from the graphic above showing the locations where fossils from each Eon/Era/Period/Epoch can be experienced. Y HOLOCENE The epoch in which we are currently living started around 10,000 years ago. Tasmanian Wolves, Carolina Parakeets and Dodo Birds are but a few of the species which have gone extinct in this epoch. 0.01-2.6mya Fossils from the Pleistocene look quite similar to organisms currently living today. A good site to visit is the La Brea Tar Pits in Los Angeles. Comanche National Grassland - Trip 4. Apatosaurus and Allosaurus tracks. 488.3-542mya The Burgess Shale in Canada's Yoho National Park is arguably the most famous fossil site on earth. *Timeline dates in this table are from the University of California Museum of Paleontology. Dates on the graphic at top are from an unknown source but the point there is on the relative scale, not the exact dates. Visit a National Park near you for National Fossil Day. Click the logo below for dates and more information from the National Park Service.